I often go for walks outside by myself. Sit nearby the water and watch the sun play its shine on the ripples, painting its art on the moving surface. For me to just tune out of my own life and zone in the world around me. During those walks, I run into all kinds of people. Some going for a walk just as me, with their partner, family, friends, or alone, walking their dog or going for a jog. Then sometimes I see people walking, of whom I get the idea, that this is the first time they resurfaced to the real world again, after a period of solitary hibernation. Maybe because I can identify, maybe it’s just personal projection and recognition, maybe not. They seem anxious in both an excited and fearful way, super self conscious and clearly exploring the outside beyond their bubble, as if just fallen from the nest. They are not together, not composed, not centered. Not at all that I claim to be any one of those things, but perhaps from my own experience in that situation, I recognize these restless beings roaming for another purpose, seeking the restfulness, aiming for that point where their life will tilt back over to a more positive direction. They are not walking away from their responsibilities, they are again meeting the reality beyond themselves and reaching back to the notion of better times ahead. I am, seemingly more than others, aware of my surroundings, but not only that. I like to see people. Not just look at them, or observe and judge, place them in the proper position of my mental picture, but see them and their story behind the posture. 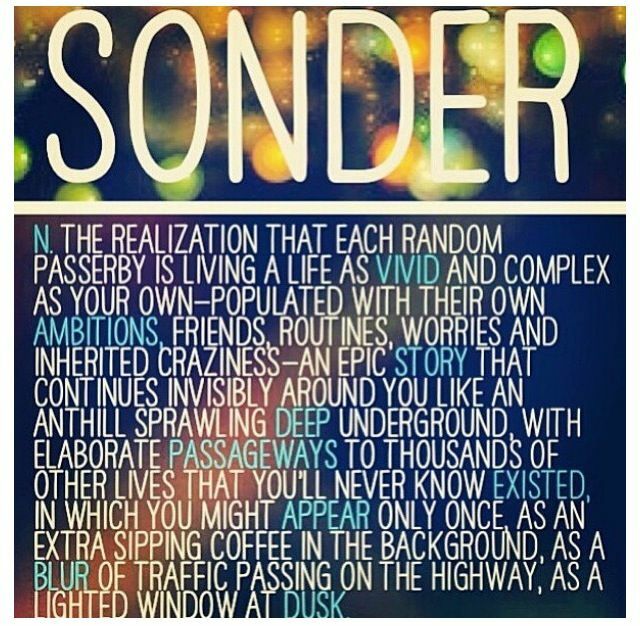 There is a name for this: sonder. The awareness that every soul you come across has a whole universe hidden behind their daily facade. A whole life of ups & downs, of cries, screams, tears, smiles, heartaches, disease, sorrow, loss, love, hurt, intentions, desires, mistakes, fantasies, knowledge, wisdom, emotions. It’s fascinating to me, not only to see and think about, analyse and even feel it in their presence. But alone the thought, that I, as an outsider to them, will never be part of theirs as they will never be of mine. Although it could be.. when worlds collide, split open and intervene with each other. On a daily basis, it doesn’t always happen like that, though. We sit and stare, as do they. We observe and care, maybe also on their part. But we will never know.. For the simple reason that I prefer to respect people in their being, as I would appreciate the same from their side. While sometimes.. it is so pleasant to meet, someone who has maybe the same empathic feelers, to see and notice my little bubble, but they are in touch deeply enough with a realization that peeking through that bubble, will first of all not break my bubble, nor will it break or bother me. Sometimes I just sit in my happy pensive solitude, observing the reality of reality and the reality of other’s reality, and then there is just this one friendly man, walking his old yet playful dog, and he asks me with sincere interest: “how is your game going?”, meaning my obsessive preoccupation and busy typing on my phone. I look up, take my earphones out, my sunglasses off, smile at him and tell him: “I’m not playing a game, I’m writing..” …BOOM… Worlds have collided, bubbles burst open, a conversation has commenced. Just like that. Being part of a life, not just my own.